Do you have an outdoor living space at your home in Savannah, Georgia, that is going unused? If so, turn to Porch Outfitters to transform it into a beautiful, functional space that will be perfect for everything from weekend barbecues and family dinners to simply relaxing and enjoying the serenity of the outdoors. As outdoor living specialists, Porch Outfitters can build a wide range of outdoor structures to meet the unique needs of homeowners throughout Savannah, GA. For example, if you’d simply like a place to sit outside and enjoy the sunshine, we can build a patio from premium pavers that will continue to look beautiful year after year. 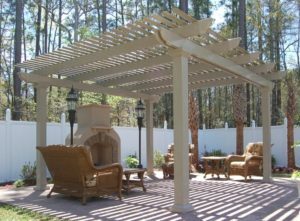 We can also construct a beautiful pergola to help define your outdoor space and provide some shade. Additionally, we can build top-quality screen enclosures and TEMO sunrooms. Available in many different sizes and styles, these enclosures will allow you to enjoy your outdoor space without having to deal with the hassles, such as pesky insects. Allow Porch Outfitters to help you get more enjoyment from the outdoor living area of your home in Savannah, GA. Contact us today to learn more.